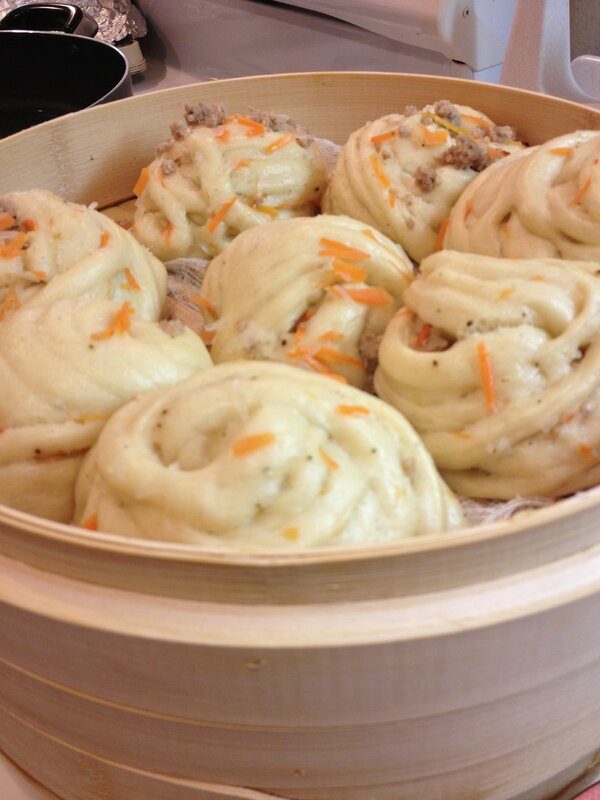 The actual Chinese name for this steamed bun/bao-ze in the shape of seashell or snail shell is RUOSeJUWEN. RUOSe literally means 'screw'. But it would not sound right if I call it Screw Bao. This has been my favorites because it has interesting shape. You can have fun eating it by unravelling the strands like noodle. I have tried to make this many times, but never satisfied with the formula. Like many other Chinese dishes, there are no written family recipes being handed down. We all depend on the memory and passed on down from the older generation. Of course, there are cooking books that we can always referenced to. It is also very interesting to find out that whether you follow the passed down recipe or from the cook book, you find that both recipes are quite similar. The only difference is that one is written and institutionalized and the other ones are passed down to the new generation by words of mouth and with lots of interesting family story to go along with it. Since we are so busy working outside the home, I think writing down the family recipe is a good thing. We tend to eat more outside and try to cram so many things-to-do in a day that those family recipes could gotten lost. So this recipe is quite comparable to the ones that I have. But the mixing method include the poolish that I my formula did not have before. And interestingly, there isn't that much water required to mix the main dough. Mix 3 oz of poolish (1:1 flour: water and a pinch of yeast & 3 days old) with 2 C of flour, and 1/2 C (to 3/4 C if needed) water. Knead to form into a nice medium soft dough. Set aside. Beat 3/4 C of egg whites (from 5 AA Large size eggs) with 1/4 C of sugar. Just enough to mix the sugar together well. Add 2 Tbsp of shortening. Mix. Then, add, 1 tsp baking soda. Set aside. Shift flour mixture into the poolish mixture. Add beaten egg white mixture. Start mixing everything together with spoon or with the palm of your hand until a nice smooth ball forms - 10 minutes. The dough should be as soft as your ear lobe. Cover and let rise until double in size. Cover your bamboo steamer with cheesecloth and get the steamer's bottom pot ready with water. Set aside. Prepare the filling ingredients that you would like to add. Filling: * Microwaving time depends on your microwave's power. 1/2 a package of FEN-Se (Bean Thread Vermicelli) - Rehydrate the FEN-Se in hot water. Thin Rice Stick would work also. The bean thread should be soft after 5 minutes, but not disintegrated. Use a clean sanitized kitchen scissors and cut the bean thread into 3 inch length. 1/2 C Carrots, - thinly julienned. Microwave the carrots for 1-2 minutes with 1 tsp of water, covered with microwave splatter shield to keep the steam in. * Microwave the carrots just enough to get it out of crisp so it will be easier to roll in the dough. Mix 1/2 Cup of ground pork with 1/2 tsp Kosher salt. Place on a microwaveable plate. Cover the plate with microwave splatter shield cover. Microwave the ground pork mixture for 1 minutes. Stir at 30 seconds and separate large chunks into small pieces. *Drain the bean thread and carrot mixture thoroughly. Add the pork to carrots and bean thread mixture and mix well. Taste and add seasonings - salt and pepper and any thing else you like. I added 1/4 tsp of Chili Flakes in mine. 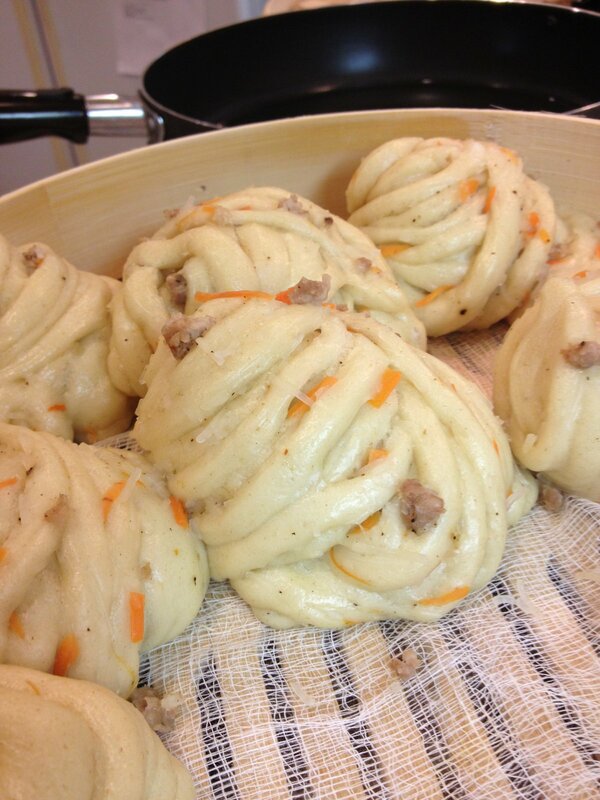 Portion the dough into two. Roll out one portion into rectangle. Spread the bean thread mixture with pork over the dough. Fold into halves. Slice the dough at1/4 inch intervals. Hold both ends with hands and stretch out to -- at least 6 inches and while holding one end of the dough with left hand twirl the right dough end around the left hand that is holding the dough to form a turban or snail looking twirled dough. Scoop the dough off the fingers and tuck the right dough end under. I had to do a few before it 'looks good'. Cover and let it rise for 1 hr (if your kitchen is 65'F like mine) until it has risen 1/2 time it's size. & soft to the touch. Bring the water to full boil. Place the bamboo steamer on top of the pan - the boiling water should not touch the bottom of the bamboo basket. There should be at least 2 inches of gap between the boiling water and the steamer basket. Steam at high temperature for 12 minutes. Turn off the heat. Let it cool for a few minutes with lid on. Transfer the basket over a large platter to catch the steam evaporation. Re-steam or fry it in skillet with a bit of oil to brown the bottom the next day. You can eat this with or without Soy sauce and vinegar dipping sauce or serve with main course dishes. Thanks, Kit for visiting and checking it out. It's really delicious.